Pleomorphic adenoma is the most common benign tumor of major and minor salivary glands mostly arising from the parotid gland. The tumor generally known to be a slow growing mass and does not involve the adjacent structure. It remains clinically silent and patient usually present with cosmetic reasons. It arises either from myoepithelial cells or ductal reserve cells. Its occurrence in skin is an unusual presentation. We report a case of ectopic mixed salivary tumor occurring in auricle. A 40-year-old female patient presented with a complaint of mass in right tragal region since 3 years which was painless and progressively increasing in size. There were no other complaints. On physical examination, a subcutaneous mass of 20 mm × 10 mm in size, oval in shape arising from right tragus [Figure 1]. It was nontender, firm, immobile, and irregular in consistency. Overlying skin was normal. Rest of the ear examination, general physical examination, and laboratory investigations were not contributory to this case. Fine-needle aspiration cytology (FNAC) was done and was inconclusive. Excision biopsy was performed under local anesthesia. Vertical incision was made over tragus and mass was removed in to-to. Mass was lying in subcutaneous tissue and was separated from tragal cartilage by loose connective tissue [Figure 2]. Integrity of the overlying skin was preserved. Following excision of mass, primary closure of the defect was done. Patient was discharged from hospital and was on regular follow-up. Biopsy specimen was sent for histopathological examination. Report shows presence of the ductal epithelium along with fibromyxoid stroma and foci of cartilaginous tissue, suggestive of pleomorphic adenoma. Radiology was not needed. Postoperative healing was good. No signs of recurrence were found in 6-month follow-up period. It was 20 mm × 10 mm oval, grey-white, smooth surfaced, well-encapsulated [Figure 3] and on cut section shows areas of bluish tissue indicating areas of gelatinous myxoid stroma without cystic degeneration. Shows typical morphology epithelial/myoepithelial cell areas are punctuated by myxochondroid areas. 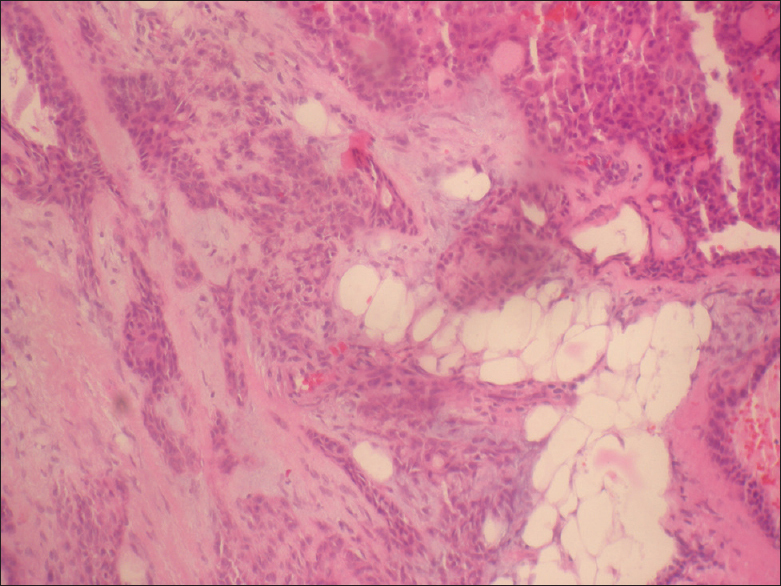 The pink myxochondroid areas are a very characteristic feature of this tumor. The myxochondroid areas show the pink hyaline to fibrous stroma (right arrow) embedded in blue myxoid background [Figure 4]. The myoepithelial elements may show spindle morphology and may arrange in dense fascicles mimicking myoepithelioma (hematoxylin and eosin stain). Pleomorphic adenoma is most common benign salivary gland tumor arising mostly from major salivary glands but can also arise from minor salivary gland tumors of normal or ectopic sites. These tumors can also arise from accessory salivary gland tissue which lies anterior to parotid glands, but they are considered as normal anatomical variants. Skin is another rare site of origin of pleomorphic adenoma where it arises from ectopic salivary gland tissue, Sebaceous glands, and sweat glands. The presence of pleomorphic adenoma in skin is known as chondroid syringoma or mixed tumor. 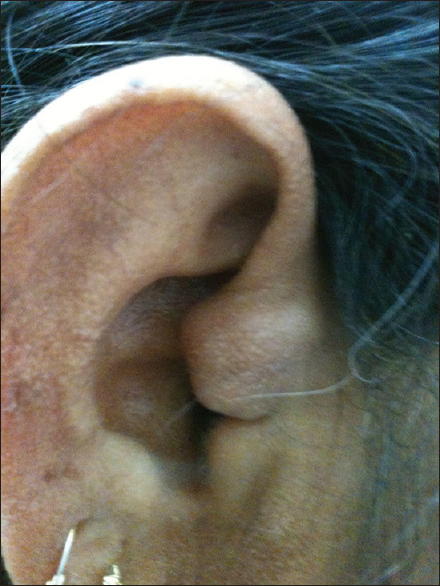 Pleomorphic adenoma is a rare tumor of auricle. It usually present as slow-growing painless mass with cosmetic deformity. Treatment is complete surgical excision. Its unusual location and rare occurrence add interest to this case. Chomette G, Auriol M. Oral and Head and Neck histopathology. Paris: Masson; 1986. p. 210-2. Willis RA. Some unusual developmental heterotopias. Br Med J 1968;3:267-72. Lahoz Zamarro MT, Valero Ruiz J, Royo López J, Yus Gotor C, Camara F. Mixed tumor of the external auditory canal. Acta Otorrinolaringol Esp 1990;41:53-6. Trotoux L, Lefebre B. Pathology of the salivary glands. Enc Med Chir Orl. Paris: Masson; 1979. Suzuki K, Moribe K, Baba S. A rare case of pleomorphic adenoma of lateral wall of nasal cavity - With special reference of statistical observation of pleomorphic adenoma of nasal cavity in Japan. Nihon Jibiinkoka Gakkai Kaiho 1990;93:740-5. Campos A, Bagán JV, Zapater E, Martorell M, Basterra J. Pleomorphic adenoma of the minor salivary gland. Acta Otorrinolaringol Esp 1995;46:331-4. Testa D, Staibano S, Guerra G, Mascolo M, Galera F, Iovine R, et al. Pleomorphic Adenoma in Ectopic Salivary Tissue of the Neck. Open Otorhinolaryngol J 2008;2:13-5. Kumar R, Sagar P, Sharma SC, Mathur S, Ghosh R. Auricular pleomorphic adenoma: Case report and review of literature. Indian J Otol 2011;17:181-2. Maran AG, Gaze M, Wilson JA. Stell and Maran's Head and Neck Surgery. 3 rd ed. Linacre House, Jourden Hill, Oxford: Butterworth-Heinemann Ltd.; 1993. p. 269-95. Badia L, Weir JN, Robinson AC. Heterotopic pleomorphic adenoma of the external nose. J Laryngol Otol 1996;110:376-8. Nishimura S, Murofushi T, Sugasawa M. Pleomorphic adenoma of the auricle. Eur Arch Otorhinolaryngol 1999;256:22-4.